The Women of the DC Universe: Series 1: Catwoman Bust is available at Amazon! 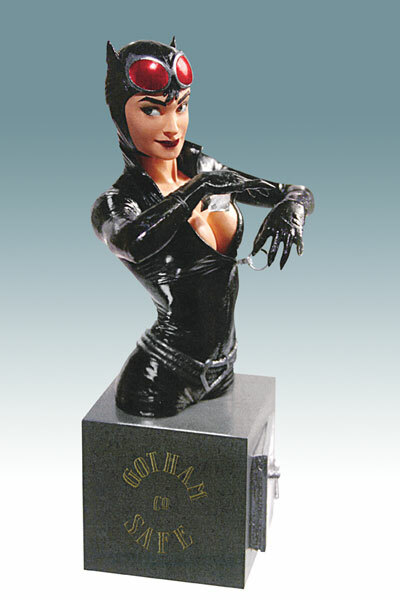 Catwoman (Selina Kyle) is DC Comics’ ultimate cat burglar and a gorgeous addition to this popular line of busts from DC Direct. Batman’s feline fatale has pulled another job, and this time has to stash the loot (a beautiful diamond) quickly and in the only way she knows how. The base of the sculpture is the Gotham Safe the sultry safe cracker has just opened. This bust stands 5.5″ high. It’s designed by Adam Hughes and sculpted by John G. Mathews. Step out of the shadows and procure the Women of the DC Universe: Series 1: Catwoman Bust by DC Direct!